Dave Warren is an AMS certified meteorologist with nearly 20 years of forecasting experience, a strong science background and skilled on the most up-to-date computer weather systems. 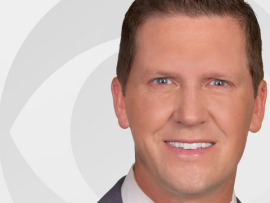 He joined CBS4 News (Miami) in November, 2016 as weeknight meteorologist. Prior to joining CBS4, Dave worked at WTXF-TV, Philadelphia, Pennsylvania. He has also worked as a meteorologist at Al Jazeera America in New Your City, WCAU-TV in Philadelphia and KPAX-TV in Missoula, Montana. Dave has covered a wide range of national weather events such as the California drought, the 2000 wildfires in the Western United States, the record snowfall winter of 2009-2010 in Philadelphia and Hurricane Sandy. Dave is a graduate of the University of Oklahoma with a Bachelor of Science Degree in Meteorology. In addition to his AMS credentials, he is a Certified Broadcast Meteorologist (CBM) and member of the American Meteorology Society. Dave was born just outside of Philadelphia and became a weather enthusiast one day when a round of golf was cut short by a violent thunderstorm. His interest in thunderstorms is what led him to tornado alley and one of the top Meteorology schools in the country. Dave enjoys working with students and teachers to share his knowledge of meteorology. He has been a mentor for the Student Weather Station and Datastream Atmosphere, programs that brings meteorological science curriculum into the classroom. As an Eagle Scout he also works closely with the scouting community and will often be seen visiting local troops to help the boys get their Weather Merit Badge. Dave is happily married and has three children. His twins were born on Christmas Eve and his youngest was born on Tax Day. His wife has ties to South Florida and loves taking the children to the beach. Dave loves the South Florida warm weather and takes full advantage of the extended golf season whenever he can get away from work and daddy duties.